Omigod, a cup - how amazing is that?? Well, there's more to it; I painted it. 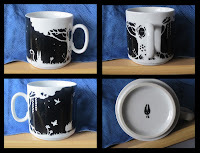 :) Decided to do the first double page panel of Flea's Journey, slightly modified on a porcelain cup. Was having my usual wander in the local art shop, and strayed accidently into the more 'crafts' area, and spotted the cup and magic pens. :D Needed plenty of layers on there, and then 'fired' in the oven. Just a bit of fun!